The mobile app offered to Canadians by Pinnacle is very simple to download and can be used on both iOS and Android devices. After installing the Pinnacle Lite app you’ll realise very quickly that a lot of attention has gone into making it user-friendly, quick and simple to use on the go. Click the link below to sign up to Pinnacle. Enter the Pinnacle VIP code in the required space. Once your account’s active, go to the Apple store and download the app. Type your details into the app so the accounts can link. Deposit some cash and start playing! Once your account’s active, go to the Google Play store and download the app. You can get the Pinnacle app on iOS and Android devices. The app takes up very little space and can be used on almost every model. It’s smooth and responsive no matter what device you’re using so you shouldn’t have any problems placing wagers on your favourite games, even if your phone isn’t the newest version. The next thing we tested were the key features that the Pinnacle app offered. The service offers the three main things a mobile app in the betting arena should. You can easily place bets, you can easily deposit money and you can set reminders so Canadians won’t miss any sports or casino action on the go. We found the Pinnacle mobile app to be really easy to use, with a straightforward, well-presented interface and no glitching. It responds super well and switches between screens with no bother at all. Only the important information is displayed so it’s easy to read and clean looking. Veterans of the betting app world will have no issues using it and newcomers can pick it up super quickly. 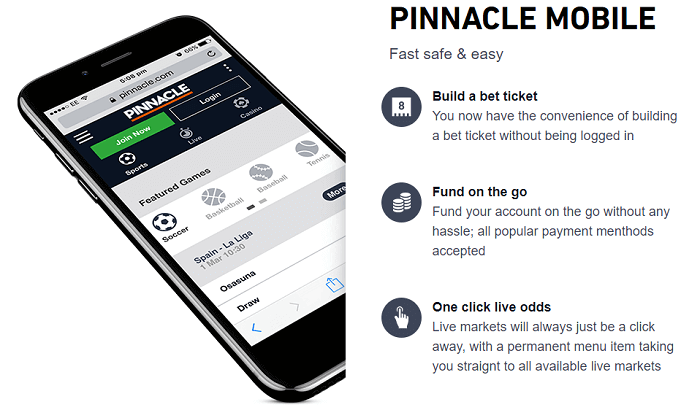 We decided to also have a look at the sportsbook side of Pinnacle, so you have all the info on the options available to you when you make an account. Pinnacle doesn’t have the biggest or most varied sportsbook out there, but it’s got a very good collection allowing Canadians to bet on most of the most popular ones and a couple more unusual ones too. The biggest and most impressive area is by far the soccer area. There’s a good range of markets available both in Canada and elsewhere and we found the odds to be above average at the time of testing. It was great to see the site offering such competitive odds and seriously great value for your bet compared to other operators. Of course, soccer is great for fans of the game, and they’ll be super pleased when they see the odds and markets but the site also offers some pretty great odds on other sports too, with good markets and again with odds that during our testing period were often well above average. 1. How do I place my bet? Open up the app on your phone. On the homepage, choose the sport you want to bet on. Make your selection from the big range of options available. Once you choose, your selection will be put into your bet slip. Click the bet slip, type in your stake and hit “confirm” to wager. 2. How do I make payments on the app? With the Pinnacle mobile app, you can very rapidly sign in and deposit into your account. You can’t withdraw money from the app at present, however, we’re hoping this is a feature that’ll be added with time. Click on your account on the homepage. Hit the deposit money option. Select your method of payment and type in how much you’d like to deposit. Hit “confirm” and check your bank balance to make sure the money’s transferred. 3. Does Pinnacle make any other apps? Nope! 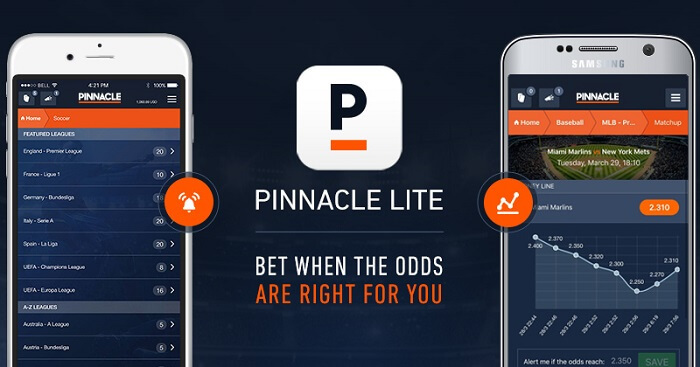 The Pinnacle app covers all betting platforms, making it easy to switch between sports and casino betting whenever you want. 4. Do I get any extra bonuses for playing on the app? Unfortunately, there aren’t any extra bonuses for mobile players at present. We really enjoyed using the Pinnacle mobile app. Canadians can sign up using Pinnacle’s VIP code meaning you can get betting with great odds very quickly, so you can get looking at the markets on the go. The download process was stress-free, the app works fast and the interface is well designed and simple, making it super easy to use. After opening your account with Pinnacle, we’d definitely recommend downloading the mobile app too. Unfortunately, you still can’t withdraw funds through the app alone, but this is the only thing we could find with the app to fault.